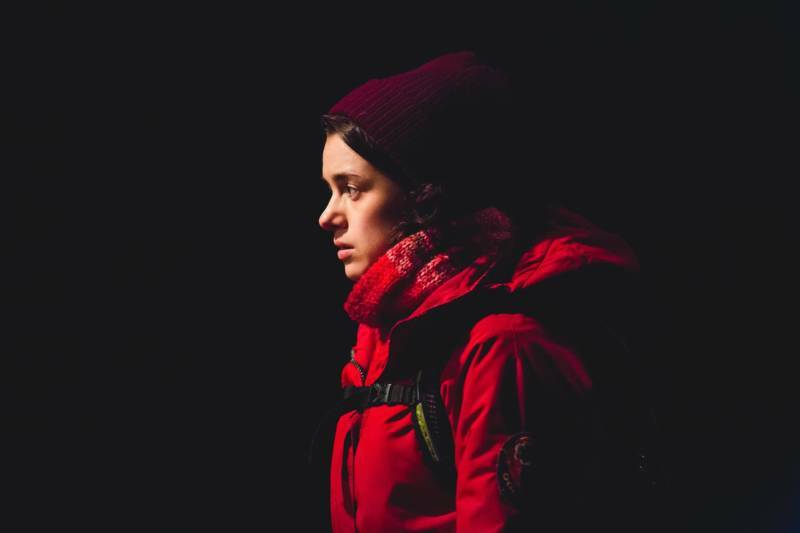 It's a cliché in theater at this point: waxing rhapsodic about spending two hours in the dark with strangers, sharing an experience that's impossible to replicate, and walking out onto the sidewalk bonded over your collective transformation. The thing about The Jungle, currently at the Curran Theater, is it's true. I cannot accurately convey the experience of seeing The Jungle. Oh, sure, I can tell you that in order to immerse the audience inside a refugee camp, the interior of the Curran Theater has been completely transformed with a brand-new floor, walls, ceiling and set built on top of the theater's orchestra seating. (See a time-lapse video of it here.) I can tell you that as attendees sit at tables in the theater, which has now become a restaurant, actors tumble into the audience, brush against seated attendee's backs, spill water and oranges into their laps, and employ them to hold flashlights and drums. But that doesn't explain that this immersive set isn't the gimmicky sort, utilized to augment a dull play. Rather, the wood bark on the floor, the ratty cardboard strewn about, the actual fruit flies inside the Curran—it all lends more impact to a story of refugees who, as one describes them, "are not people but between people, drowning in a sea of suffering." The Jungle takes place in the recent past, at a makeshift cafe in the refugee camp at Calais, France. 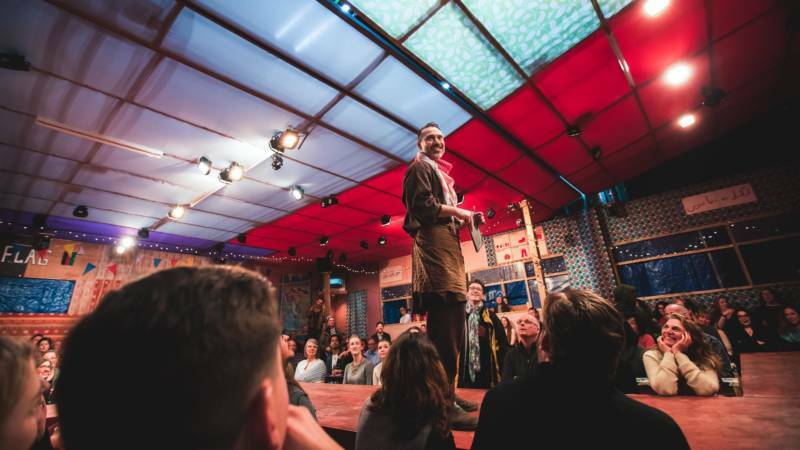 Nestled among thousands of people hoping to get to the UK from over two dozen different countries, the cafe serves as a meeting place for leaders from different countries' camps to help each other, hold celebrations, and plan against evictions over naan and tea. Soon, young British activists arrive, swiftly apologize on behalf of their country, and set out to help. They bring optimism about successfully fighting eviction of the camp by French police, along with some naïvete of the harrowing path its residents have taken to get there. Over the course of the play's events, with the set used to dramatic effect—at one key moment producing loud gasps—they are accepted and trusted. 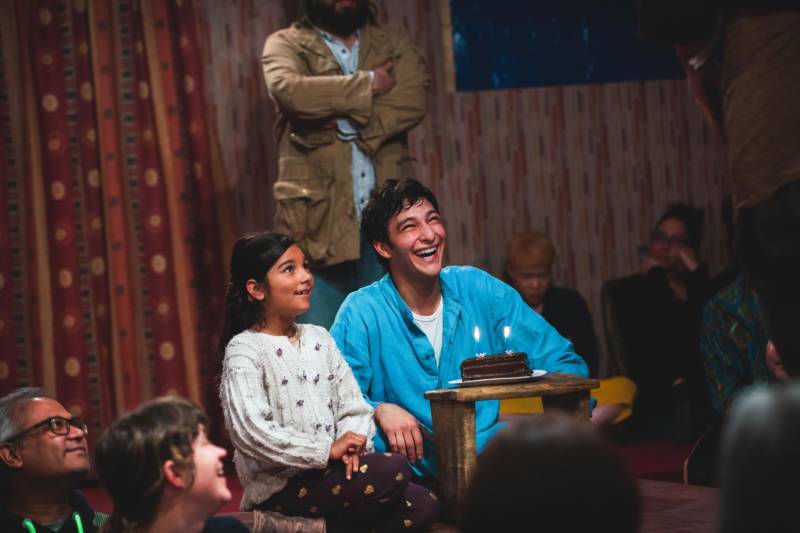 The ensemble cast here is top-notch, particularly cafe owner Salar (Ben Turner) and young, well-meaning Beth (Rachel Redford), whose inner turmoil over sending beaten, scarred refugee Okot (John Pfumojena) to be smuggled in a lorry across the English Channel is one of the play's several emotional gut-punches. Other highlights include Eton graduate Sam (Tommy Letts) as a one-man planning department, Hele (Nahel Tzegai) as the happy quitter who decides against immigrating to the UK due to its changing tolerance of immigrants, Boxer (Trevor Fox) as the camp's drunken serenader and Little Amal (Zara Rasti) as the 6 year-old girl everyone knows they must protect. 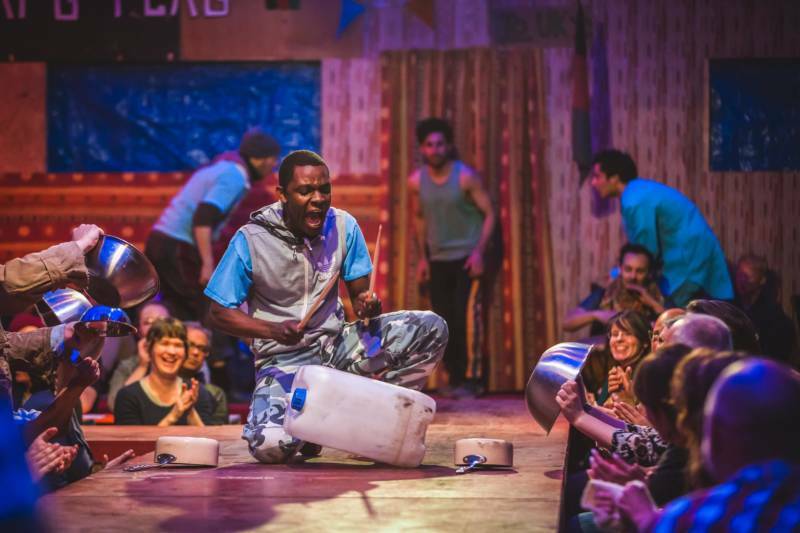 What will ensure The Jungle lasts in revivals when “everything that's going on now” is a distant, shameful memory is the play's innate understanding of grassroots organizing and communal living in desperate circumstances. The Jungle is as much about activism's unorganized hierarchy of responsibilities and duties as it is about refugees. Inside the camp cafe, we see classic ego clashes, hair-brained schemes that actually work, fights driven by a shared passion, and hope in the face of insurmountable odds. Whether it be Calais, Occupy, the Dakota Access Pipeline or Ferguson, every movement has a similar array of figures and friction. 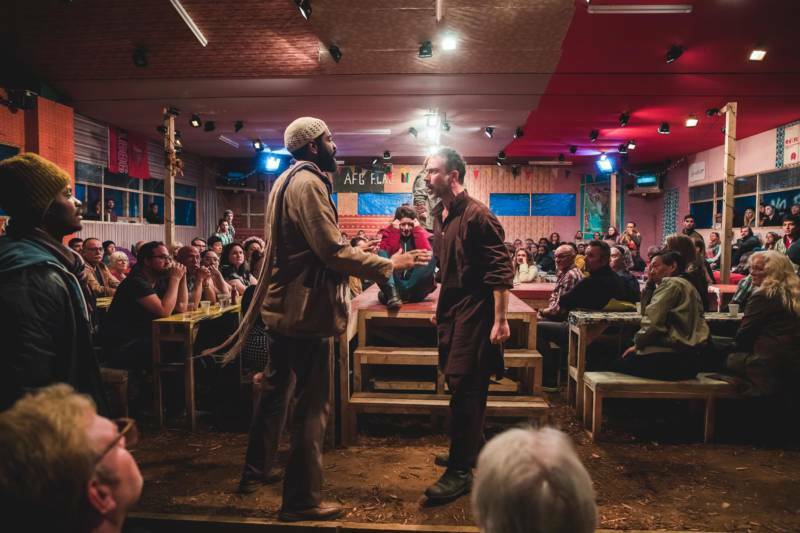 Adding to the realism are two of the show's actors, Yasin Moradi and Mohamed Sarrar, who actually lived in the camp in Calais upon which the play is based. Despite a sudden shift in tone at the end (when Safi (Ammar Haj Ahmad) breaks the fourth wall to address the audience about ongoing grassroots efforts for refugees), The Jungle creates a vivid world that's intimate, raw, and real, particularly for those sitting among the action in the cafe's table seating. It's an incredible thing to be a part of for two and a half hours, and I can't get it out of my head. 'The Jungle' runs through May 19 at the Curran Theater in San Francisco. Details here.